C-MARC™ is at it again, this time winning highest marks and recommendations from Hifi Knights online magazine. "...the very best of their kind..."
"...the ability to extract the very essence of each major device with no drawbacks..."
"...allows a component to fully flourish yet remains unseen while doing so." "...can be twisted, bent and tangled far more than the usual suspects... Routing in-between components is very easy with this one." "...less veiled, more orderly, sported cleaner more lively background and served all nuances in more subtle and delicate fashion." "...far better on detail retrieval and sounded cleaner yet not artificial at all. Not in the slightest." "...its own character is no character at all." "...did far better in showcasing what the AMP-13R is truly capable of and there was a lot to show. Not even one thing the Lithuanian did of lesser quality than the Excellence and the more I switched between these two vastly different cords, the more I acknowledged that the difference between 'em went far deeper than their voicing." "...delivered more refined and sophisticated outcome." "...fabulously black background for music, fine detail retrieval, smoothness, maturity, balance and insight..."
"It's meant for an enthusiast seeking to fully unlock his setup's potential to push it even further, yet with its core flavour intact." 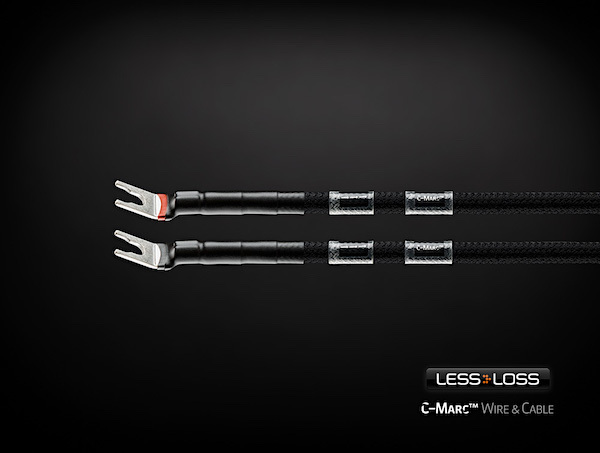 "...LessLoss C-MARC loudspeaker cable gets my vote..."
Click here to learn more about this superb loudspeaker cable. We can make jumpers out of it for you!